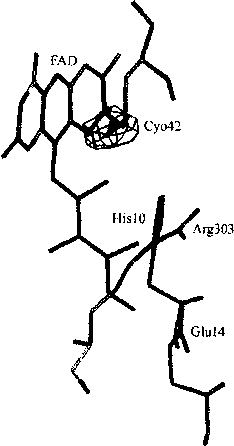 2 J. I. Yeh, A. Claiborne, and W. G. J. Hoi, Biochemistry 35, 9951 (1996). 3 A. Claiborne, J. I. Yeh, C. Mallett, J. Luba, E. J. Crane III, V. Charrier, and D. Parsonage, Biochemistry 38, 15407(1999). 5 S.-R. Lee, K.-S. Kwon, S.-R. Kim, and S. G. Rhee,./. Biol. Chem. 273, 15366 (1998). 6 S. Veeraraghava, C. C. Mello, E. J. Androphy, and J. D. Baleja, Biochemistry 38,16115 (1999). 7 M. A. Gorman, S. Morera, D. G. Rothwell, E. de La Fortelle, C. D. Mol, J. A. Tainer, I. D. Hickson, and P. S. Freemont, EMBO J. 16, 6548 (1997). 8 A. Claiborne, T. C. Mallett, J. I. Yeh, J. Luba, and D. Parsonage, Adv. Protein Chem. 58,215 (2001). cystine per subunit and NADH reduction generates one Cys-SH.9 In Npx, the cycling between the reduced thiol or thiolate and the oxidized sulfenate or sulfenic acid of residue 42 is an intrinsic part of the catalytic cycle (species 1 and 3, Scheme 1) as the formation of the catalytically competent thiolate form (species 2, Scheme 1) precedes the binding of H2O2. The structures of native, oxidized Npx to 2.1 A resolution and the NADH-bound reduced form at 2.85 A resolution have yielded insight into how elements of the protein help to stabilize and modulate the redox and catalytic properties of this enzyme. This chapter describes the experimental approaches used to capture the active, sulfenic acid form of Npx as well as the NADH-reduced form, to outline the steps that were taken to minimize oxidation to an inactive form during crystal growth and X-ray data collection. 9 L. B. Poole and A. Claiborne, J. Biol. Chem. 261, 14525 (1986). 10 K. Becker, S. N. Savvides, M. Keese, R. H. Schirmer, and P. A. Karplus, Nat. Struct. Biol. 5, 267 (1998). 11 H.-J. Choi, S. W. Kang, C.-H. Yang, S. G. Rhee, and S.-E. Ryu, Nat. Struct. Biol. 5,400 (1998). 12 W. S. Allison, Accounts Chem. Res. 9, 293 (1976). Fig. 1. Dimer interface of Npx. FAD and cysteine-sulfenic acid (Cys-SOH, denoted in figure as Cyo-42) residue indicate the active site of Npx, which is formed at the dimer interface. Residues from each monomer subunit at the interface contribute to the tight packing; numbered residues from one monomer subunit are differentiated from the second by primes. The tight packing shown limits solvent accessibility, stabilizing the labile cysteine-sulfenic acid (Cyo-42) by burying the group in an apolar environment of the protein. In addition, the hydrogen-bonding chain formed by Arg-307, Glu-14, Arg-303, His-10, and Cyo-42 stabilizes the sulfenate form (SO") of the cysteine-sulfenic acid, further enhancing the stability of this reactive group. An understanding of the redox mechanism can be helpful in monitoring the state of the enzyme or protein before structural analysis. For Npx, a simple spectro-photometric assay9 to determine the activity of the enzyme allowed us to assess the oxidation state of the crystals before data collection in most cases or to confirm the oxidation state of the enzyme in the crystals after structural analysis. Although protein sulfenates are generally unstable, reactivities of sulfenic acids in proteins can span a wide range. For some proteins, severe limitation of exposure to oxygen and persistent presence of reducing agents are necessary to prevent significant oxidation whereas for others, oxidation/inactivation by ambient oxygen is a slow process and these proteins can be stored under ambient conditions for hours to days before a substantial population of the protein molecules is oxidized. Hence, it may be necessary to empirically determine the sensitivity of a protein through various means, as indicated in the preceding section. For Npx, we were able to use a spectrophotometric activity assay to ascertain whether freshly expressed and purified protein, stored protein, and protein obtained from dissolved crystals at various time points were active. These measurements gave us some general understanding of the time frame over which oxidation of the enzyme occurred and the expected oxidation state of the protein crystals before X-ray structure analysis. 13 H. R. Ellis and L. B. Poole, Biochemistry 36, 15013 (1997). 14 E. J. Crane III, D. Parsonage, and A. Claiborne, Biochemistry 35, 2380 (1996). 15 D. Parsonage and A. Claiborne, Biochemistry 34, 435 (1995). A final unambiguous view of the oxidation state of the enzyme was obtained after our structural analysis. To obtain a native, active, cysteine-sulfenic acid-containing crystal structure of Npx, several precautionary measures were taken. X-ray structure determination of a protein containing a cysteine-sulfenic acid may require additional precautions in order to prevent the formation of oxidation artifacts. With the advent of cryotech-niques during data collection, the production of free radicals that result in crystal decay, among other phenomena, has been minimized. 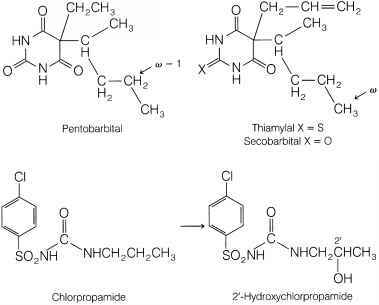 These free radicals can also presumably be the cause of oxidation of sulfenic acids as the radicals can readily oxidize the acid to its more stable, higher oxidation states and, consequently, use of cryogenic temperatures during data collection can also minimize these oxidation events. However, in some systems, data collection at cryogenic temperatures alone may not be sufficient to prevent the oxidation of sulfenic acids as these groups are highly labile and could presumably react with any residual molecules, including ambient oxygen, before and during crystal growth. An earlier X-ray crystal structure of the Npx had shown oxidation of what is now known to be the sulfenic acid to a sulfonic acid.16 To maximize the possibility of crystallizing the active, sulfenic acid form of the enzyme, freshly prepared protein was used for crystallization setups and crystals were stored under argon, as described below. 16 T. Stehle, S. A. Ahmed, A. Claiborne, and G. E. Schulz, J. Mol. Biol. 221, 1325 (1991). Cys-SOH is utilized in catalysis or regulation, highlighting the significance of the local protein environment in stabilization and function of this reactive moiety. The setup for storage under inert atmospheres can be as sophisticated as a glovebox or as simple as oxygen-resistant bags constructed of polymers such as polyvinyl chloride, which with sufficient thickness can provide reasonable resistance to oxygen permeation. To purge the trays of oxygen, a gentle stream of argon is passed over the sitting drop tray before sealing it with tape. For hanging drop trays, each coverslip is lifted and argon is passed over the reservoir before reseating each drop. These crystallization trays are then placed into an oxygen-resistant bag and the bag is purged with argon. As argon is heavier than air, the argon displaces oxygen from the system. Care is taken to flush out the system on a routine basis to sustain an inert atmosphere and crystals of active Npx are maintained for more than 6 months by this method. A monitoring system is not used for Npx, but for more sensitive proteins oxygen sensors can be used to measure the amount of oxygen in the setup and care can be taken to maintain the oxygen levels at a low value. 17 J. I. Yeh et al., manuscript in preparation (2002). presence of H202.9 This assay, which can be directly correlated to the cysteine-sulfenic acid oxidation state, is a useful and expedient means of monitoring oxygen-aging effects. A unit of activity is defined as the amount of enzyme that catalyzes the oxidation of 1 ¿xmol of NADH/min at 25°. This allows the monitoring of the redox state of Npx, because oxidation of the sulfenic acid at residue 42 to sulfinic or sulfonic acid forms can be distinguished in this assay as diminished or abolished activity of the enzyme. During the catalytic cycle, SOH must first be reduced to the thiolate by NADH; this precedes binding of H202 (see Scheme 1). When the sulfenic acid is oxidized to the sulfinic or sulfonic acid form, the initial "priming step" for the formation of the critical thiolate cannot occur and, hence, hydrogen peroxide cannot bind to the active site. Although NADH can still bind, this assay readily ascertains the oxidation state of the cysteine at position 42, as reductants such as dithionite or NADH can monitor the presence of redox intermediates through UV-visible and fluorescence properties.18 Reductive titrations of wild-type Npx generate a charge-transfer intermediate characteristic of the two-electron reduced (EH2) forms of most disulfide reductases.9 In Npx, this absorbance band is centered at 540 nm and is due to the electronic interaction between the nascent Cys-42-S~ and the oxidized FAD. When the sulfenic acid is oxidized to sulfinic or sulfonic acid forms, reduction to Cys-42-S~ is not possible and hence reduction or absence of the 540-nm absorbance band can be used to monitor the presence of these oxidized species. Similarly, NADH reduction experiments with intact crystals (described below) can be done, where color changes in the crystals can be simply visualized under a microscope to ascertain the oxidation state of the sulfenic acid at position 42. 18 C. H. Williams, Jr., L. D. Arscott, R. G. Matthews, C. Thorpe, and K. D. Wilkinson, Methods Enzymol. 62, 185 (1979). around a residue and refining the remaining model. Atoms within a 3-A shell are restrained in order to avoid artificial movement into the omitted region. Each cycle includes manual adjustment and fitting into difference Fouriers [(Fsoak — Fnative) exp(! 'acaic_native)] and additive Fouriers [(2Fsoak - Fmliw)e\p(iacaic_niitiye)] maps.19 These maps show unambiguously that the resulting difference electron density at position 42 best fits a Cys-42-SOH model (Fig. 2), whereas Cys-S03H results in two negative density peaks in the maps, indicating that the model contains too many atoms at that site. To obtain the NADH-reduced structure, NADH is added to intact crystals; this is done with crystals of the cysteine-sulfenic acid and cysteine-sulfinic acid forms. In the case of the active, sulfenic acid form, addition of NADH immediately turns the yellow crystals red, signifying reduction of the sulfenic acid. To obtain this complex of Npx with NADH, a 100 mM solution of NADH is freshly prepared in Tris buffer, pH 6.8, and diluted 1:10 with the artificial mother liquor, for a final concentration of 10 mM. Crystals are soaked in this solution for several minutes, during which the crystals turn from yellow to red, signifying reduction of the sulfenic acid. Once the red color is observed, the crystal is flash-frozen to 100 K and data are collected to capture the reduced form. The frozen crystal remains red throughout data collection, indicating a charge-transfer complex between Cys-42-Sy, and the isoalloxazine of FAD is formed. When this same procedure is performed on crystals that have the inactive, sulfinic acid-oxidized form, the red shift is not observed, even with addition of a molar excess of NADH. The crystal structure of this sulfinic acid form shows that although NADH is bound, reduction of the sulfinic acid cannot occur17 and, hence, a charge-transfer complex does not form with the isoalloxazine ring of FAD. Although soaking in NADH causes minor changes in cell parameters and overall structural conformation, considerable changes are found at the active site. The overall extent of structural changes that occurs on soaking is reflected in /?iso values, when compared with the apo form, of 19-25%. These values are appreciably higher than 7?merge values of 5-9% within apo forms or within NADH-bound forms. Structurally, these changes reflect reorientation of several side chain groups immediately at the active site of Npx, to accommodate bound NADH, as well as a shift in the isoalloxazine ring of FAD. 19 P. A. Karplus and G. E. Schulz, J. Mol. Biol. 210, 163 (1989). Fig. 2. Residual electron density. A <TA-weighted F0 — Fc electron density map contoured at 3.5 a of the active site of Npx. The strong positive electron density identifies the position of the oxygen of the sulfenic acid residue (Cyo42). The map was calculated with a model containing a cysteine residue at position 42. The single, strong peak unambiguously identifies the residue at position 42 as a cysteine-sulfenic acid. Active site residues that are important for stabilizing the sulfenic acid include His-10 and Arg-303, whereas Glu-14 participates in forming the tight dimer interface that limits solvent accessibility, important for maintaining the oxidation state of the sulfenic acid. difference (F0 — Fc) density map. 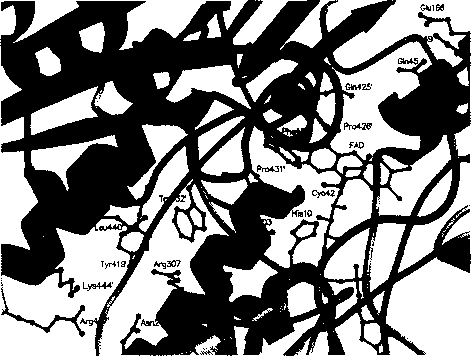 After these first maps are examined, a cysteine is placed at residue 42 and another round of refinement is completed. The difference Fouriers clearly show densities corresponding to NADH and reveal areas of conformational change in the structures. Examination of the difference Fourier and additive Fourier maps allows assignment of the oxidation state of residue 42 to correspond to a sulfhydryl. X-ray structural characterization of cysteine-sulfenic acid-containing proteins is one of the most defining approaches to characterizing this rapidly growing class of protein functional groups. Although outside the scope of this chapter, these structural analyses can lead to kinetic measurements in the crystal that allow intermediate states to be trapped, visualized, and studied. An understanding of the biochemistry of these reactive groups can be more fully gained by studying the localized protein environment in which these groups function. Increased perception of how elements of a protein can stabilize and contribute to modulation of function in these systems will allow novel means of enhancing or inhibiting function in important classes of protein molecules, including transcription factors and redox-regulated enzymes. This work was supported by the National Institutes of Health NRSA Fellowship DK-09568 (J.I.Y.) and the National Institutes of Health Grant GM-35394 (A.c.).